Alright, this is going to be a bit more expansive report then usual. I've decided to go with my initial plan for this after much debate. One plan I gained via twitter was to split it up Corner Outfielders and Center fielders, but on my top fifteen outfielder list there are only three center fielders listed. The rest of the list has five players I've listed as Corner Outfielders and seven that haven't yet defined their positions as professionals. The first prospect we'll highlight in this bunch is Scott Krieger, the Right Fielder drafted in the 19th round this year. Krieger is an advanced hitter and he flashed good power with short-season Helena. He hit 13 home runs and drove in 53 in 68 games. The bad? He also struck out 103 times. Next up will be Maxwell Walla. Walla is a high school player and very raw at that, still he has shown enough to be considered a high ceiling hitter. Don't expect him to rocket through the minor leagues, but hope for steady improvement from year to year. He was a second round pick this year and hit just .201 for the Arizona Brewers. Moving on we have D'Vontrey Richardson. A fifth round pick this year, Richardson was a two-sport athlete at Florida State, the second being football. He didn't play in the Minors this year but with the Seminoles this past season he hit .304. He's very athletic and projects as a corner outfielder. Chris Ellington is the next outfielder on the list. Ellington is another college hitter who had a nice year at Helena. He hit .285 with 29 extra-base hits and a .320 OBP, but more importantly he struck out only 58 times in 70 games. Brendan Katin is a name that we heard a bit during this past season. He has what some folks would call "Country Power." In 127 games this past year he had 63 extra-base hits, he also has a big arm defensively. The massive hole in his game would be his strike zone, he whiffed 164 times last season and walked only 35 times. On a side note, in the Venezuelan winter league Katin has walked 10 times in 22 games to sport a .373 OBP. 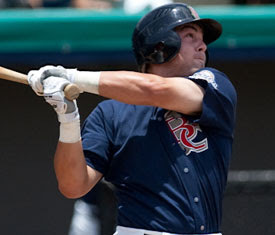 Keeping the roll going we have Lee Haydel, a speedster who played for the Brevard County Manatees in 2009. He hit .275 this year but had on OBP of just .302, he'll need to improve his plate presence as he continues up the ladder. If he doesn't improve in that facet or start hitting more extra-base hits his best fit may be as a fourth or fifth outfielder. And at number four we have Kentrail Davis who makes it this high purely on potential and his college production. In two years with Tennessee he batted .319, hit 22 homers and drove in 74. 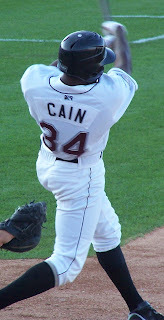 He played center in college but many scouting reports project him as a corner outfielder who will develop more power. Lorenzo Cain had a 2009 to forget, after a severe knee injury in the spring he never really found his stride. For the year he hit .218 with 15 extra-base hits and a .295 OBP. Nothing to write home about, but he will probably be assigned to Triple-A Nashville for 2010. Combine his bad year with the big year our next prospect had and Cain is no longer the top Center Fielder prospect in the Farm System. That next prospect would be Logan Schafer, the teams minor league hitter of the year. Schafer hit lead off for the Manatees and batted .308 with 31 doubles and 76 runs scored. He also had a .370 OBP, just an all-around solid year in 2009. The top prospect is the third member of Brevard County's outfield, Caleb Gindl. Gindl is a Rightfielder and the heir apparent to Corey Hart in a couple of seasons. 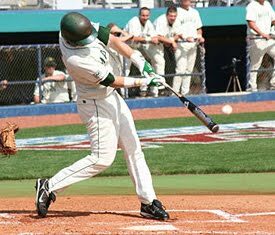 At 5'9" he has very good pop (17 home runs in 2009), a good eye at the plate (.363 OBP) and has been a solid run producer (71 RBI's). Not bad for the diminutive outfielder. Overall the depth at the Outfield spots has improved greatly over the past couple of drafts. There are some very exciting players coming up in the form of Gindl, Schafer and Cain. If Davis and Richardson turn out to be the players the Crew thinks they can be, then the future looks even brighter between the foul poles.